The resultant vector and equilibrant vector have the same magnitudes and point in the opposite direction. A sailboat undergoes a force vector of 50N [N 40˚ W] and a second force vector of 30N [E 10˚ N]. ∴ The equilibrant vector is 43.6 N [S 3.3˚ E]. Remember that unit vectors have magnitude equal to 1. The only one whose magnitude equals 1 is: The rest of the choices will not equal 1. The dot product is also known as the scalar product. Two vectors are parallel if the dot product of the vectors equals one, 1. 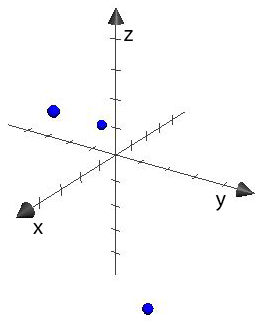 Two vectors are perpendicular if the dot product of the vectors equals zero, 0. Calculate the dot product of the following given the magnitudes and angle. The vectors are perpendicular since the direction cosine equals zero. Two vectors are parallel if the cross product of the vectors equals zero, 0. 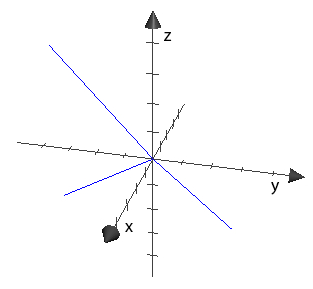 Two vectors are perpendicular if the cross product of the vectors does not equal zero (basically almost any vectors in 3-space). Cross product cannot be used to determine if two vectors are perpendicular -- this is the job of the dot product (equal to zero). The cross product is used to determine the magnitude or value of a perpendicular vector. Thumb: → ∴ The thumb points downwards. Thumb: → ∴ The thumb points upwards. Vectors are perpendicular in 3-space unless the cross product equals zero. Calculate the cross products using the 2 × 2 matrix (not shown).. This is the distributive property. Theory of Scalar and Vector Properties of Cross Product, Dot Product, etc. "Cross product of a scalar and a vector produces a vector"; there is no such thing. Any dot product produces a scalar. Adding vectors produces a vector because they all have directions. Product of a scalar and a vector produces a vector because the scalar is a multiplication factor of the vector, which maintains its direction. Cross product formula in the form and : Check to see each cross product: And, Clearly they are not equal: This is because they point in opposite directions. Use the right-hand-rule to determine the direction the cross product points. The area of a triangle is half the area of a parallelogram. Complete the following using the points below, assuming they all lie on the same plane. Make sure to choose two vectors with the same origin (here the origin is B for both vectors). Do the cross product first, followed by the dot product of that cross product you just did. This gives you the area of a parallelogram (the base of the parallelepiped in this case). Then this area of the bast is dotted with the 'height' of the parallelepiped to give the volume... use the absolute value of this. Vectors are coplanar if the volume = 0. (Do cross product first) Therefore the vectors are non-coplanar. is the angle between the force (F) and the object that is pushed. The ________ of two direction vectors gives you a third direction vector that is perpendicular to the first two. A line can intersect a plane an infinite number of times when the line is on the plane. The line is orthogonal (perpendicular) to the normal of the plane, and not on the plane. When the vector line and the normal of the plane are perpendicular, then the vector line is parallel to the plane. There are infinite values for the scalar multiple when the line is 'on' the plane. 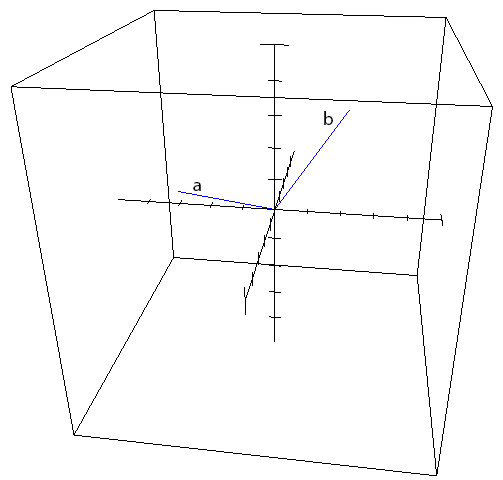 In 2-space, the vectors are coplanar. Set the two 'z' equations equal, given that z = 5 and z = 6 + 7s... solve for 's', Substitute 's' value into the parametric equations to solve for 'x', 'y' and 'z'. 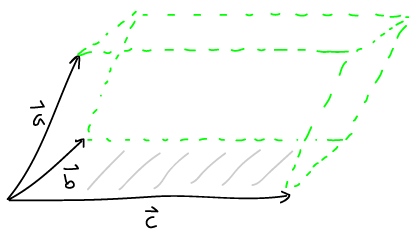 Skew lines are lines that are not parallel and do not intersect. This is not possible in 2D, it is only possible in 3D. If the planes overlap, they would intersect at an infinite number of points. Three planes intersect at one point. Sub (2, 7, -2) into both equations and check if the solutions are the same. If they are not the same, then the given point is not a point of intersection, i.e. not a solution to the system. 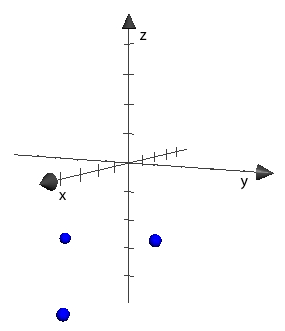 Therefore the point, (2, 7, 1) is not a point of intersection (POI) of the given planes. The planes are not 'coincident' (overlapping) because the last values ('D', 'E') differ. Since the planes have the same normals (A, B, C) but different constants at the end, then they are only parallel. Two planes that do not intersect are parallel and non-coincident. Two planes can intersect along a line. Two planes can intersect at a point. Two coincident planes have infinite intersection points and solutions. While planes can intersect along a continuous line, they cannot intersect at a single point in space. Notice that the normal of the two equations are not equal, meaning the planes are not parallel. Normals are found from the coefficients of the equation when written only in standard (Cartesian) form: Also note that if the planes are parallel and the constant on the right side of the Cartesian equation is the same in both, then the planes are coincident with infinite number of solutions or intersection points. Also note that two planes intersect along a line, and not at a single point. A line parallel to the line of intersection will have the same direction vector, . The parametric equations can be found by combining the point N(1, 2, 3) and the direction vector . Get the normal from the cross product of the direction vectors. First check if the planes are at least parallel. Planes are parallel when their normals are collinear. [If the planes are not parallel then they are definitely not coplanar] Get the normal from the cross product of the direction vectors. Since the normals are scalar multiples of eachother, then we can conclude that the two planes are at least parallel. Finally, check if the planes are coplanar by substituting the position vector from one plane, into the other plane equation, to see if (L.S. = R.S.). Get one more equation... And then substitute 's' into it... Therefore the planes are coplanar. First make any point out of one of the line equations. It is easiest to choose a y-intercept or x-intercept. 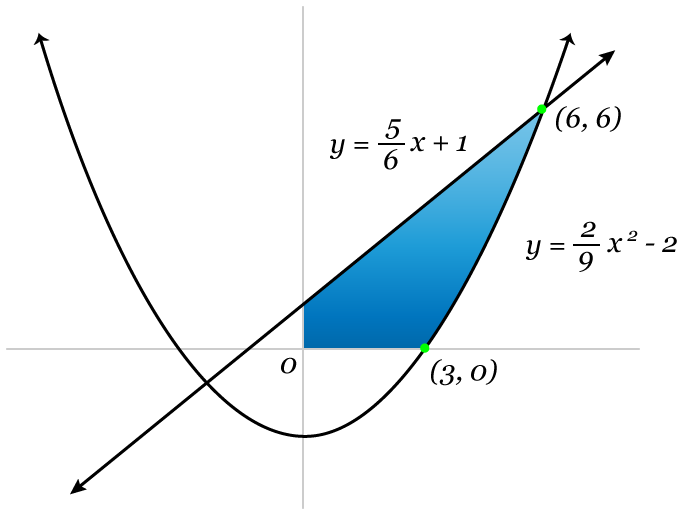 The new distance equation uses the given point 'N' and the point on the vector 'P'. Notice that the numerator involves the cross product between the direction vector and the line 'NP'. First we must find a point (x, y, z) on one of the planes, and use this with the other plane equation in the distance formula. To find a point on the plane, it is easiest to find an x, y, or z intercept. (E.g.) to find the x-intercept, plug y=0 and z=0 into one of the equations. x = -2, y = 0, z = 0, A = 1, B = -3, C = 4, D = -5. Solve the following limits, which are rather simple. If the limit (dependent, y-value) was not the same on either side of 'n', then the limit, does not exist. While the function is defined at x = 3, and exists, the limit from the negative side, does not exist (D.N.E.). Therefore, since the limit on either side is not the same (DNE & 0), then DNE. While one would assume that the limit would be undefined because the denominator would be zero, the fraction can be algebraically manipulated so that the denominator is not only “x.” The limit exists at all points where the slope is defined (for example, not at: cusps, inflection points, or discontinuities). Remember that the limit gives you the slope at a point, or if a point is not given, then it's just the equation of the slope. Divide everything by a factor of 'x'.. Determine the values for the cubic function below (where a, b, c ∈ R and a, b, c ≠ 0). Determine an equation for a using given information Determine an equation for b using given information Substitute a (found earlier) into the equation to solve for b. Substitute b into the equation found earlier to solve for a. Calculate b(10): The highest number of bacteria is 15300 (since the amount of bacteria, b, is in hundreds). A limit can be broken up and expanded into component functions. Using the following statements for the questions below. Any coefficient can be brought outside of a limit and limits of functions can be broken into separate components. The correct version of III: The 'a' value should not be multiplied into the limit. For each of the following sketches of piecewise functions, determine whether the function is continuous at point 'a' and whether the limit exits as 'x' approaches 'a'. False, even if a piecewise function is discontinuous at 'a', occasionally the limit exists as 'x' approaches 'a'. Continuity: The piecewise function is discontinuous at 'a' because you would have to lift a pen off of the function, to trace along its path. Continuity: The piecewise function is continuous at 'a' because you don't have to lift a pen off of the function, to trace along its path. All real values of 'x' exist in the domain of the piecewise function. 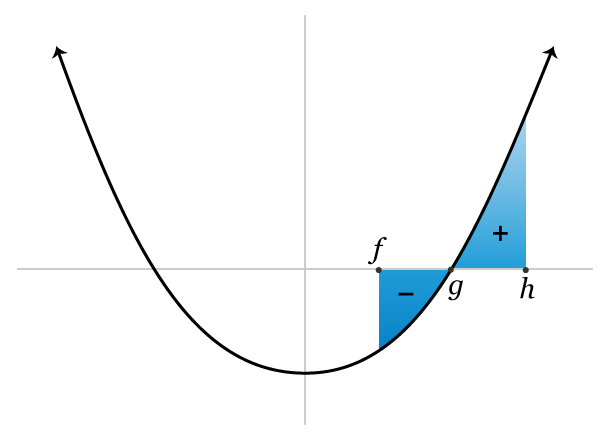 If ƒ(a) is a defined point at “a,” that means that the function must continue, so ƒ(x) must be continuous at “a.” A limit approaching "a" from either side is always the same as long as there is not a sudden brake in the function, so the statement in "b" must apply to a continuous function as well. 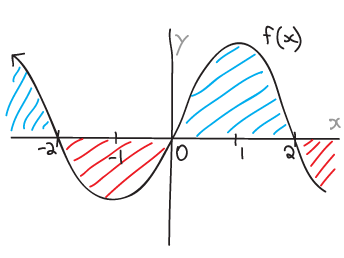 For a continuous function, there are no asymptotes or holes, so the limit as x approaches "a" must always be equal to f(a) and therefore the function is not continuous for the condition outlined in option c.
d)	The absolute value is a trick and does not affect the continuity of the function. The function is defined at all points. h)	Not continuous because it has asymptotes at such that n ∈ Ζ. There is a break at x = 1. 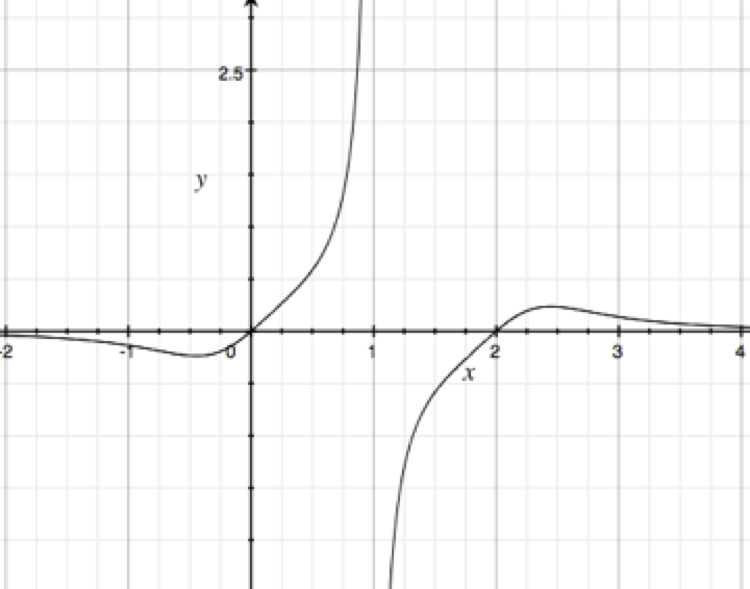 See that the second function has a vertical asymptote at x = -3 From a quick sketch [not shown] of the piecewise functions, you can see there is a discontinuity at x = -3. 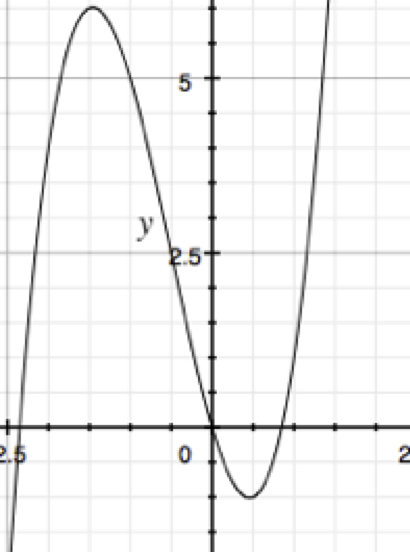 For the function to be continuous at 'x = 6' the y-values must be the same at that point. 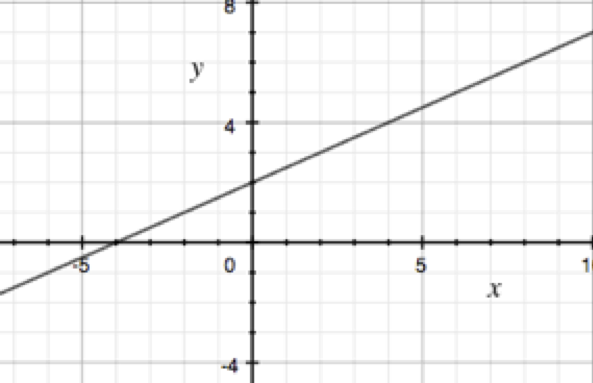 For the function to be continuous at some point of 'x' the y-values must be equal at that point. Hint: Slope at the vertex point. Linear density is a measurement of the change in mass of a material, over a length. Given the position function, where s(t) is position in meters, at time 't' in seconds. Differentiate, use a calculator do evaluate your values. Leibniz Notation is one way to apply the chain rule. Differentiate, using Leibniz Notation, find . To differentiate ƒ(x), the product rule must be used, and to find the component derivatives, the chain rule must be used. Therefore I is correct. Therefore II is correct. Therefore III is incorrect, so the correct answer is b.
Differentiate and determine the indicated values, using a calculator. If the object is moving to the right, the slope of the graph must be increasing. An object is moving in a straight line. 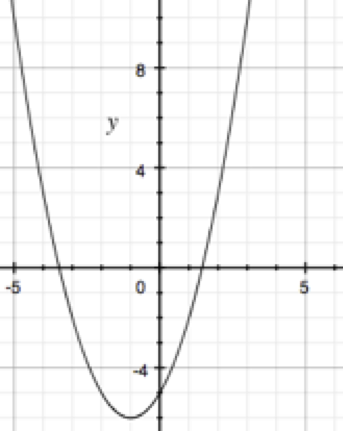 Its velocity, v is shown on the graph below as it varies with time t.
The acceleration on a velocity time graph is the slope at a certain point, which can be found with the derivative. It is only decelerating when the derivative is negative, so the answer is c.
Acceleration is the derivative of velocity so velocity is only constant when acceleration is at zero (at the x-axis). Therefore, the answer is b. The 1-dimensional motion of an object is tracked on the three graphs: position s(t), velocity v(t), and acceleration a(t). The motion is mapped over the phases A - F, and the points I - VII. [The positive direction is defined as 'to the right', and the position is comprised of piecewise, quadratic motions]. The object is slowing down in phase 'B' and 'D' and speeding up in phase 'A', 'C', 'E', and 'F'. False. In phase 'D' the object is moving to the left, but is moving away from the reference (zero) position. The motion is fastest where velocity is the highest magnitude, which is phase 'F' or point 'VII'. The object turns around at point 'V' where it is moving away from its origin, at the x-axis, and then back towards it. In phase 'B' the object is slowing down (approaching a horizontal slope on the position graph, or approaching the x-axis on the velocity graph), in the negative direction (negative slope on the position graph). In phase 'C' the object is speeding up (changing from a horizontal slope to a steeper slope on the position graph, or moving away from the x-axis on the velocity graph), in the negative direction (negative slope on the position graph). Displacement (d) is the change in position (∆s). To manipulate the variables, it is better to express velocity as a derivative of position. By canceling out, , which is correct. Therefore, the answer is true. Velocity is the change in position, so v = s'(t). Acceleration is the change in velocity over a given time, so a = s''(t). Therefore the answer is false. Velocity, v is the derivative of position, s.
At the maximum point, the second derivative, ƒ’’(x) must be decreasing because the slope is `decreasing` where the function is concave down. The height 's(t)' of a projectile over time 't' is modeled by the function below. Determine the coordinates of the extreme values of the following functions. Since “j” is in thousands, the manager should produce 2,750 jerseys. You need two equations; one from similar triangles, the other from area. You need to differentiate for Area. Let the dimensions of the rectangular lot be, “x” and “y”. You need two equations; one from similar triangles, the other from Pythagorean theorem. You need to differentiate for Length. [not shown here] Also it's best practice to do a check of the increasing [f'(x) > 0] & decreasing [f'(x) < 0] intervals, to make sure that 'L' is at a minimum. To minimize the distance between the cars 'H' we must write 'H' in terms of the same variable, 't', To minimize 'H' differentiate, And set equal to zero, and solve, Use a sign chart to substitute values surrounding this point, to inspect the slopes, to ensure the point is a minimum. First, determine an equation for area, in terms of 'x' Now to maximize area, use power rule, and set equal to zero, [Testing to verify max/min not shown here. Could use intervals or slopes] Calculate the area, The value for area is negative because it is in the domain x < 0, but we can state the area as a positive scalar magnitude. For the lower, inner triangle, For the whole, entire triangle, Combining these two equations, To maximize the viewing angle, 'θ', differentiate, and set equal to zero, Solve for the distance 'd', [Max/min verification (first or second derivative) check not shown here]. Positive and negative intervals occur are based on where the function exists above or below the x-axis for positive or negative values of y. Think of the slope of the tangent at any one point. 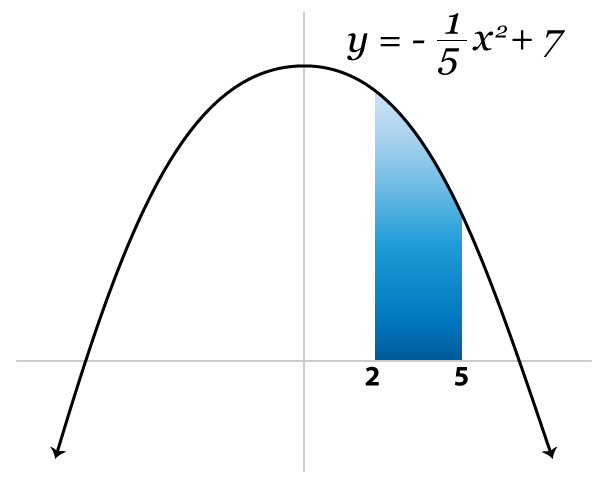 The intervals of increase have a tangent with a positive slope, and the intervals of decrease have a tangent with a negative slope. The points are considered local when the function tends to infinity in the space. The points are considered absolute (or global) when the 'y' value is the most extreme over the entire function. Complete the questions for the sketch of some, fictitious function below. A Point of Inflection (POI) is defined as the point 'x' where the concavity changes, so where f''(x) changes sign [at f''(x) = 0]. At a corner (like a cusp): f'(x) Does Not Exist (DNE) because the derivative (or limit, or slope) from the left side of 'x' does not equal the derivative (or limit, or slope) from the right side of 'x'. At a cusp (like a corner): f'(x) Does Not Exist (DNE) because the derivative (or limit, or slope) from the left side of 'x' does not equal the derivative (or limit, or slope) from the right side of 'x'. Solve each theory question below. This means the function is negative at this point (below the x-axis). If ƒ'(x) < 0, then the slope is negative, so the function is decreasing. The slope is positive if the derivative is positive (greater than zero) so the answer is c.
A vertical asymptote (VA) occurs for all values of 'x' that make the denominator equal to zero. If the degree of the denominator is greater than the degree of the numerator: The horizontal asymptote (HA) equals the 'vertical translation constant,' 'd'. If the degree of the denominator is equal to the degree of the numerator: The horizontal asymptote (HA) is found by setting the coefficients of the leading (highest) degrees of 'x' in the numerator and denominator into a fraction, and adding the 'vertical translation constant,' 'd'. The function is either increasing or negative at this point. Since we alreay know that a max or min occurs, beause f'(x) = 0. The second derivative ƒ''(x) confirms if the point is a Maximum, Minimum, or Neither. For x < 0 Since ƒ(x) is negative, the interval x < 0 is negative. For x > 0 Since ƒ(x) is positive, the interval x > 0 is positive. Using the discriminant (b2 - 4ac), we can find that there are no real solutions to the equation 5x2 - 12x + 15. ∴ (0,0) is the only point of inflection. For x < 0 For x > 0 ∴ The function is increasing everywhere, since ƒ'(x) is positive on all intervals. This means determine if the stationary/critical point is a local maximum, local minimum, or neither (point of inflection). To classify a point of inflection, substitute the turning point x-value into the second derivative function ƒ''(x). Check the sign. Positive = concave up (local MINIMUM), negative = concave down (local MAXIMUM), zero = Neither/Inconclusive. ∴ This point of inflection is neither a local maximum, nor a local minimum. It is a horizontal point of inflection. 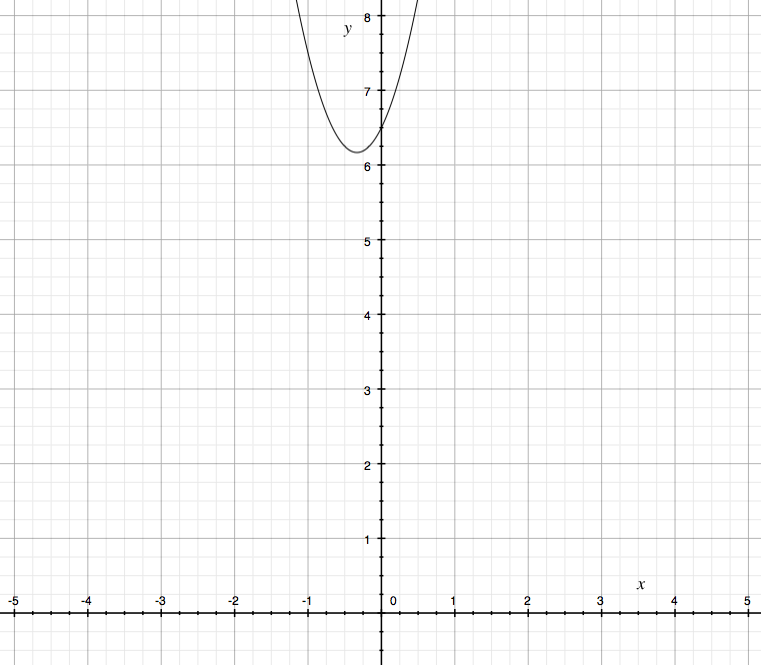 For x < 5/4... ƒ(x) is negative, ∴ the function is negative where x < 5/4. 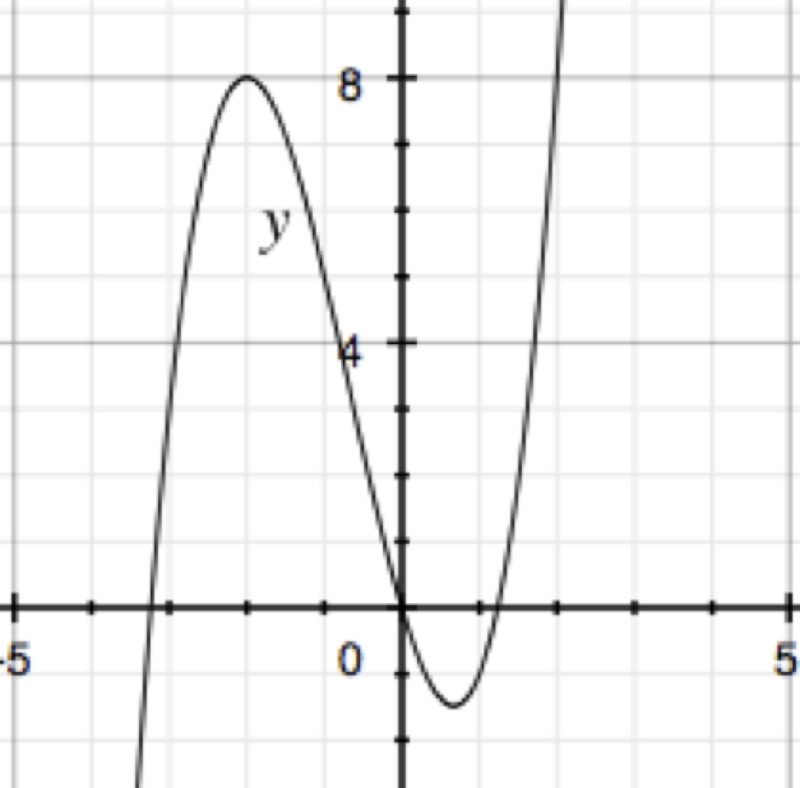 For x > 5/4... ƒ(x) is positive, ∴ the function is positive where x > 5/4. For x<5/4... 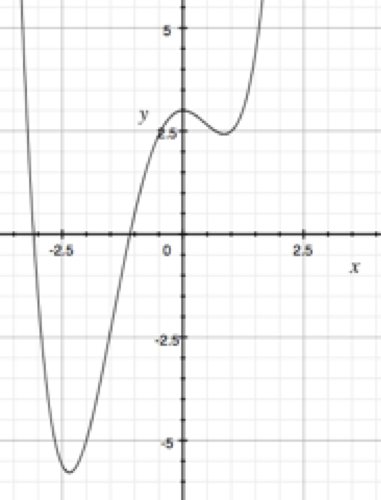 Since the derivative (slope) is negative, ∴ the function is decreasing for x<5/4. For x>5/4... 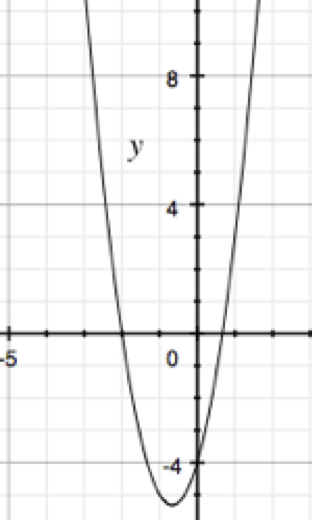 Since the derivative (slope) is negative, ∴ the function is decreasing for x>5/4. For x < -4... ∴ the function is positive on the interval x < -4. For -4 < x < -3/2... ∴ the function is negative on the interval -4 < x < -11/4. For x > -3/2... ∴ the function is positive on the interval x > -3/2. For x < -4... ∴ the function is increasing on the interval x < -4. For -4 < x < -11/4... ∴ the function is increasing on the interval -4 < x < -11/4. For -11/4 < x < -3/2... ∴ the function is decreasing on the interval -11/4 < x < -3/2. For x > -3/2... ∴ the function is decreasing on the interval x > -3/2. False, there are no vertical asymptotes because the vertical asymptote is the value of 'x' that makes the denominator equal to zero. 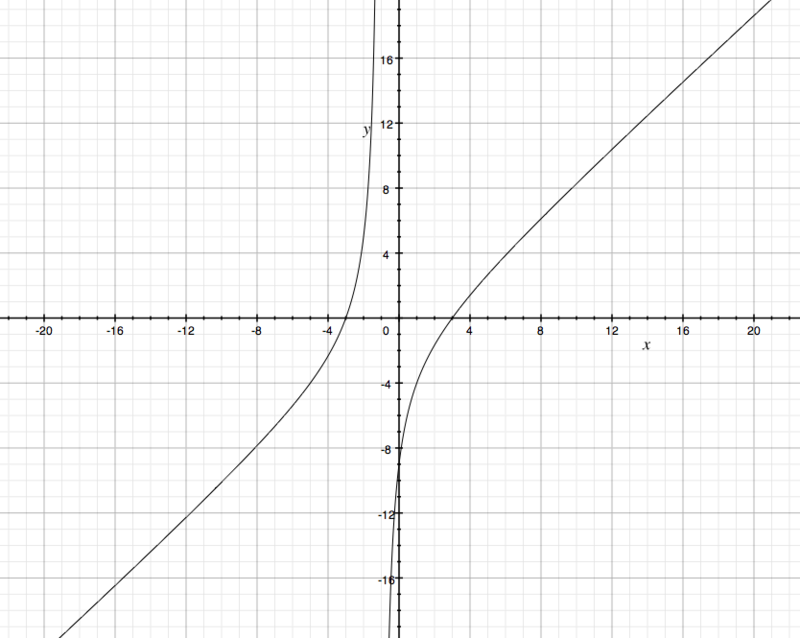 The vertical asymptote is the value of x that makes the denominator equal to zero. Therefore there is a vertical asymptote on the line x = 4. The oblique asymptote is the quotient (what you get from division). So, using polynomial division: Now one must take the limit Therefore the oblique asymptote exists on the line: y = x - 1. Does not have to be to scale, remember that it is a sketch. Mostly true... 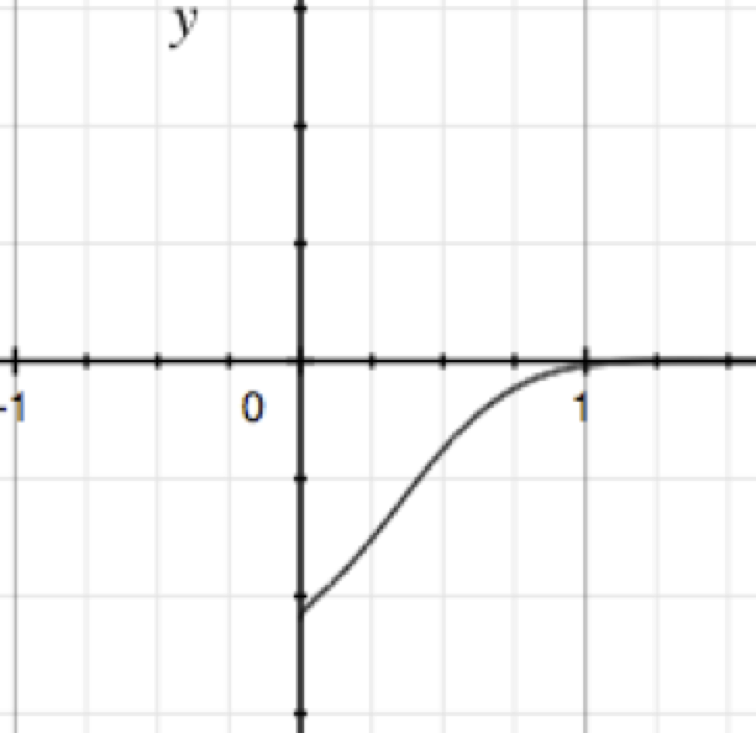 The derivative, ƒ'(x) is the slope of the original function. At ƒ'(x) = 0, the slope of ƒ(x) is zero, so therefore the graph must be “stationary” at 'x'. The exceptions are corners and cusps, where the derivative, ƒ'(x) Does Not Exist (DNE), because the limit from the left does not equal the limit from the right. Determine the critical point by setting ƒ’(x) equal to zero, and solving for x. This is where the slope of the tangent is equal to zero. Sub x into ƒ’(x) to get y: The critical point is Since ƒ''(x) > 0, therefore this point is a minimum. 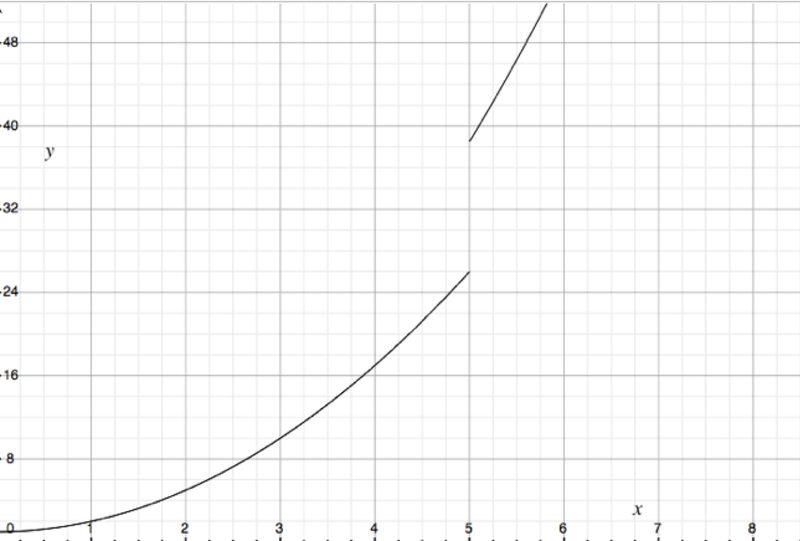 There are more possibilities for this curve as there could be any “c” value that translates the graph up or down. Roots become stationary/critical points and stationary/critical points become points of inflection. Roots become asymptotes and maxima becomes minima. Asymptotes become roots, roots become asymptotes, and maxima becomes minima. The derivative gives the equation of the slope, m, Make up a point where the tangent intercepts the curve: B(x, f(x)), then plug that into the slope equation with the point A(1, -20).. Then set this equal to the slope equation from before, m = 2x + 8 Now find 'y' using the original f(x), to give you the coordinates of the tangent points! Now determine the equation of the tangent lines, and you're done! Determine the slope 'm' of the function f(x) Make a point on f(x) that the tangent passes through: A[a, f(a)]. Then, using this and (6.75, 0)... Set the two equations for slope equal, to solve for 'a' We found 'a'! So now, So the point on the function is (5, 7). Now determine the slope 'm', Now determine the y-intercept of the tangent line using the point (5, 7) and the slope 'm' = -4 Now calculate the area of the triangle, using the y-intercept as height, and the x-intercept as the base (which was given in the question). Differentiate using implicit differentiation, to find . Differentiate using implicit differentiation. Show your work [in your notes]. Brush up on the different differentiation types first, then you will be ready for this. Practice the theory of the following derivatives, using implicit differentiation. 'a' represents a constant. Taking the ln of both sides. Then, differentiate implicitly, with respect to 'x'. Use product rule on the left-hand side. Differentiate each of the following. Remember the log laws to use when differentiating the questions below. 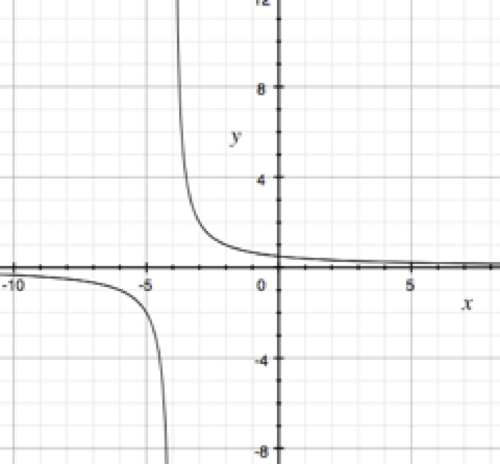 This is the derivative of the inverse cosine function, and we need to denationalize the denominator. This may be a bit tricky as a question, but we don't leave roots in the denominator. Determine the nature of the second derivative, ƒ’’(x) Since any power of 'e' must be greater than zero. 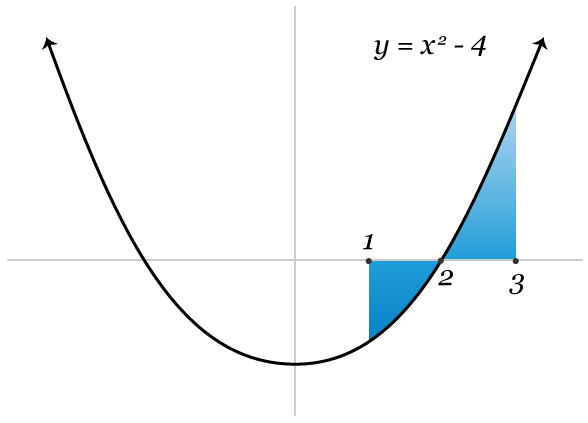 ƒ(x) is increasing when ƒ'(x) > 0 For x∈ℝ, the sign on ƒ'(x) is dependent on the sign of Since the output will be positive for every even degree of x, for all x∈ℝ, and therefore ƒ(x) > 0 for all x∈ℝ. For velocity to be constant, the acceleration must be equal to zero, and therefore the force due to the oscillating waves must be equal to the applied force on the particle. Let force be “F” and mass be “m” The force of the induced electromagnetic waves is equal to the force on the particle, so therefore the force is equal to 7.57 × 10-29 N.
Choose the best answer for each. Solve the related rate problems. 3/4 full is (3/4)(12 cm) = 9 cm height. Determine the radius when the volume is cm3, Now determine the net change in Volume, with respect to time Differentiate Volume with respect to time, Now, find the rate of change of the diameter, By the time the balloon gets to a reasonable, 20 cm diameter, it should make sense that the diameter is increasing rather slowly. Note: the speeds of the cyborg and the shadow are different because the shadow is moving and growing. Let “x” be the distance from the lighthouse to the cyborg, and “s” be the distance from the cyborg to the end of the path of light. Using similar triangles in the 'bold' triangle shown... Therefore the rate at which the shadow is growing is 2.17 ㎧. The rate at which the tip of the shadow is moving is: Therefore the tip of the shadow is moving at 9.2 ㎧. Let the distance between the cars be 'H', and the rate of separation be . All these types of integration are the reverse of differentiation. True. You can factor a constant out of the integral and it will multiply to the integral at the very end. You will use this in some questions. True. You will use this in some questions. Evaluate the following indefinite integrals by inspection. It does not matter whether you use integration by substitution or integration by parts. It is best practice to try to integrate by parts first, and then (after) try to integrate by substitution. It is best practice to try to integrate by substitution first, and then (after) try to integrate by parts. For some functions, integration by parts is 'not possible' because the integral in the intermediate step () becomes more complicated than the original function. Solve the following integrals by parts. The derivation of 'integration by parts' is based on product rule, shown below. Generally, you want to use 'integration by parts' after 'integration by substitution' doesn't work. Try to understand all the different types. The constant can be factored out of the function f(x) in-front of the interval. Definite integrals do not use the constant of integration, c! Evaluate the following definite integrals. Anti-differentiation with the limits, 3 and 'n'... Therefore n = 2 or n = -⅘. 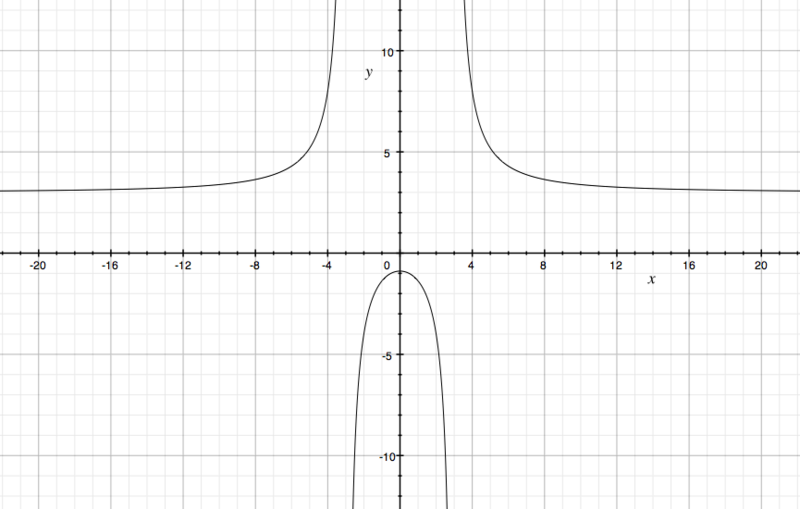 Without calculus it would be difficult to calculate the area under the curve of a parabola. The area under a function can be calculated using the definite integral. Calculate the area using the definite integral... The area under the curve is 13 ⅕ square units. 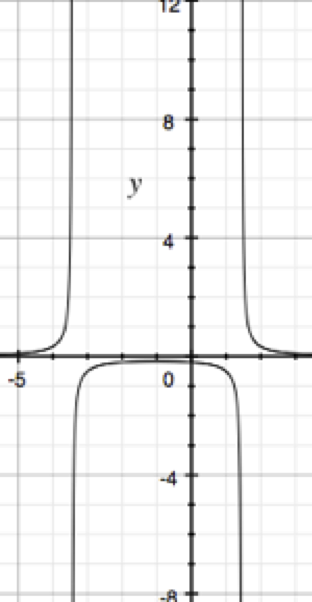 But what happens when we need to calculate area under a curve when there are parts below and above the x-axis? The integral is positive above the x-axis and negative below the x-axis. Since area cannot be negative, make sure to add the absolute values of the integrals. Subtracting like this will give you the area above the x-axis. Calculate the area under the straight line from x = 0 to x = 6. Then subtract the area under the curve from x = 3 to x = 6. Differentiating displacement from a position-time gives the gradient, which is the velocity, proof... Position is a vector quantity. The definite integral (gives area) on a velocity-time gives displacement, proof... Displacement is a vector quantity. Velocity is the integral of acceleration. Notice there is no change in direction (no x-intercept in the given interval). An object travels with the acceleration below, in m/s.